If you would like to trade links with us, please copy the Logo below, resize it to fit your site, and link it to our site at http://www.HoodLifter.com. If you don't post Logos, use all or any abbreviated, red text from the grey box below. Send us your Logo and text and we'll link it to your site, within 24 hrs, with the others as displayed on the page below. Our banner will not collect browsing statistics or install programs on your computer, nor do we utilize popup windows. Any popup windows that may appear originate from the banner destination website. who dream of owning that special car. We buy, sell, trade, consign, and locate any Muscle Cars, Street Rods, Customs, Antique, Classic Cars, and Vehicles. 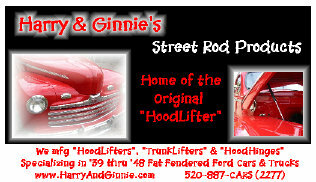 Harry & Ginnie's Street Rod Products, Home of the "HoodLifter", specializing in the Mfg. of Hood Lifters and Trunk Lifters for 1941, 1942, 1946, 1947, 1948 "Fat Fendered" Ford and Mercury Street Rods, Customs, Hot Rods, Collector Cars custom designed & mfg'd in our Tucson, USA facility. Great Old Cars: FREE Photo Classifieds for Classic, Collector and Antique Cars and Trucks. 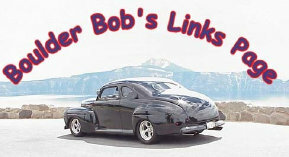 Listings include Vehicles For Sale, Events, Parts, Accessories, Services and Collectibles. Also, research information including photos, VIN decoding and Classic Car prices. Classifieds, Auto Sales, Dealers & Events: Pacific Hot Rods - Specialty Vehicle Brokering & Sales - Hot Rods, Classics, Muscle Cars, Customs, Race Cars, Exotics, Trucks, Trailers, and Motorcycles. Free Photo Classifieds & On-Line Event Schedule. Project Street Rods is dedicated to Pre-75 Cars/Trucks/Trailers/Race Cars/and Parts for Sale/Wanted. Show Coverage, Hot Rod Store, Flamed Mailboxes, and more! Check us out! Our purpose is to promote 1953 - 1956 Ford F-100's, Panels, and associated 1953 - 1956 Ford Truck products.